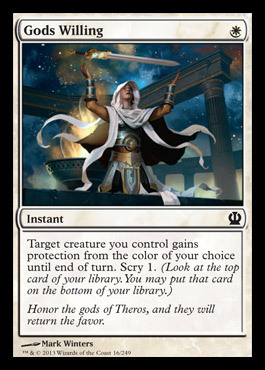 Now that the full set of Theros spoilers is out and the pre-release weekend looming (September 21st and 22nd) , I figured I'd recap some important notes to help everyone (including myself) know what to expect. 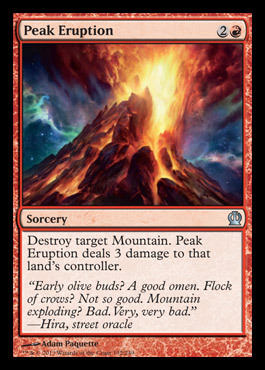 And while Wizards posted a prerelease primer of their own, I wanted to discuss some of the things that they don't: bombs, removal, combat tricks, and more. 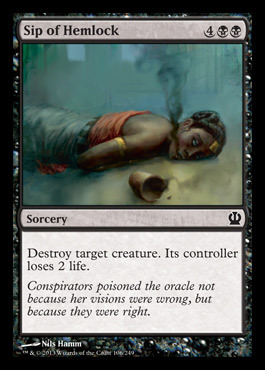 No shocker that the planeswalkers are considered bombs - but some more than others. 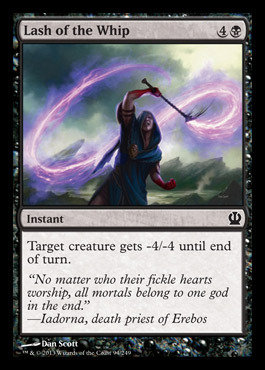 Elspeth, for example, is probably the most likely of the three to end games. 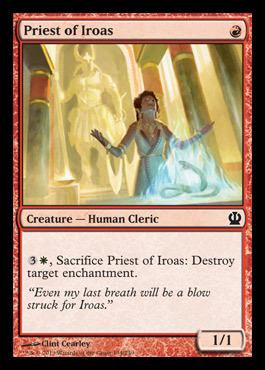 Her "wrath" effect to clear your opponent's bomb(s) is highly effective, and you can eventually overrun your opponent with tokens. 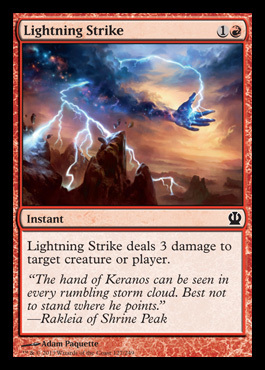 Xenagos is a very close second - mostly because he's extremely versatile, each of his three abilities being effective in different ways/game states. 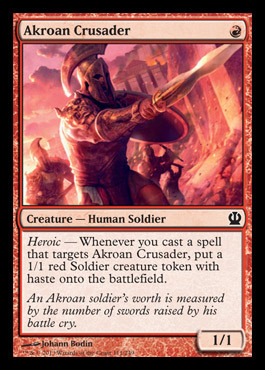 The Gods are also extremely powerful, and will likely be build-around cards in all limited environments (to help drive devotion). 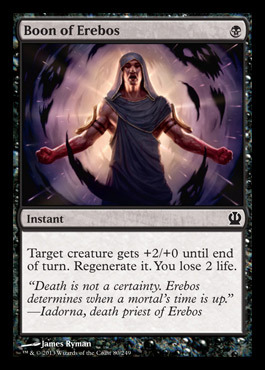 Driving to build a mono-color deck will help ensure that the God(s) you got become a creature when you drop them, or shortly thereafter. 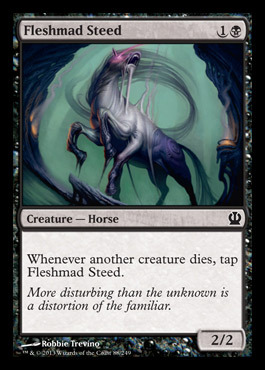 As far as the traditional bombs go, Medomai the Ageless, Ashen Rider, Stormbreath Dragon, and Hythonia the Cruel are my favorites (in that order). 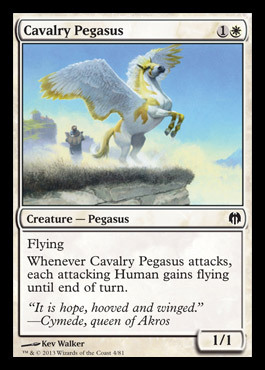 The first three have evasion *and* amazing abilities, which means that they can end games on their own. 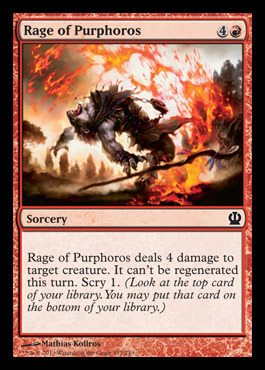 Hythonia, on the other hand, has one of the few wrath effects in Theros - but with a relevant body (that survives the wrath). Most of these are self-explanatory, as flyers just win games (especially those with 3 or more power). 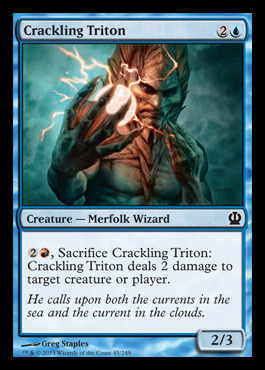 I usually only consider a non-flying creature with power 5 or greater as a potential bomb, but the Monstrosity mechanic definitely helps bend this rule. 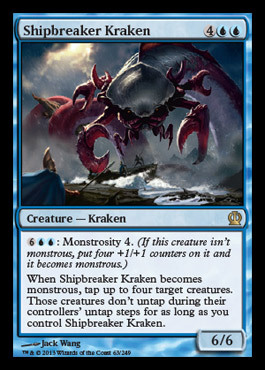 Some creatures, when "monstrous," are absolutely difficult for your opponent to deal with. 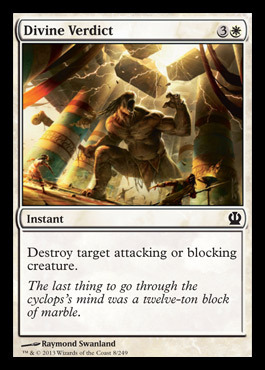 Based on these rules, as you can see, most "bombs" are rares - and that makes removal (for your opponent's bombs) that much more important. 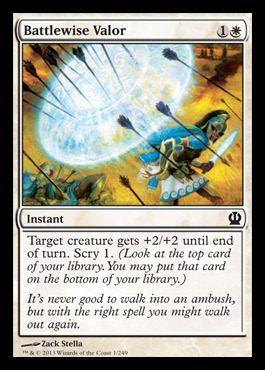 While you could argue that blue has some removal I haven't listed in the form of counterspells and "bounce" (i.e. 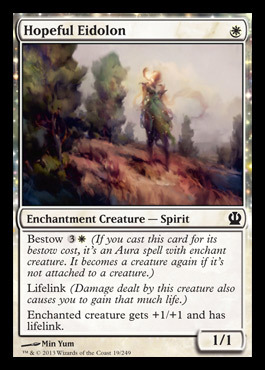 cards that return creatures to their owners hands and/or libraries), I decided to instead focus on traditional removal: destruction, exile, and damage effects. 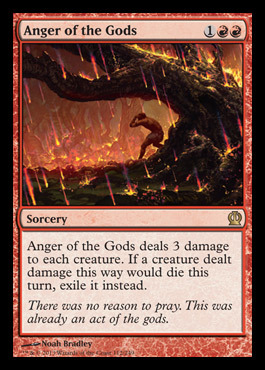 Some of these cards, like Ray of Dissolution, are also conditional - in that they are only removal under certain circumstances. 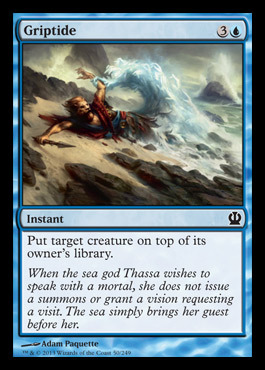 I included these because Theros is considered an "enchantment-heavy" block, even including several enchantment creatures. 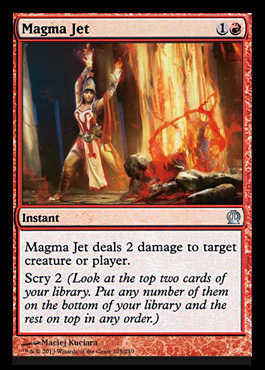 As you can see from my list/pictures, white, black, and red lead the pack in amount of removal. 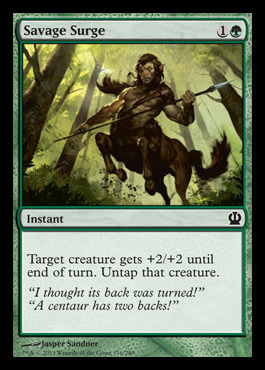 Typically, green makes up for lack of removal in giant creatures, and blue with card advantage, counters, and "tricks" (like Time Ebb from M14). 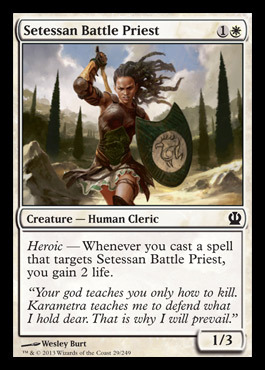 Now, onto "combat tricks," or the cards that you'll want to remember exist before making attacks or blocks in Theros. 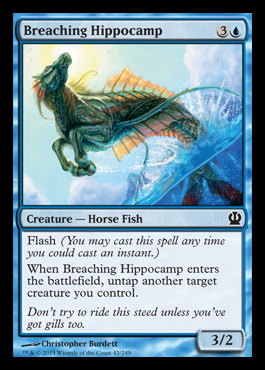 Where blue lacks in straight removal, it makes up for in Instant-speed "tricks." 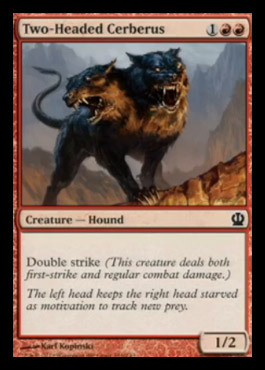 And while the amount of tricks in each color is relatively balanced, I'm liking Coordinated Assault in red and Dauntless Onslaught in white as powerful Heroic enablers. 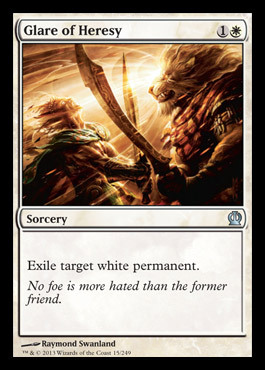 One thing is for sure: combat in Theros will be quite tricky at times. 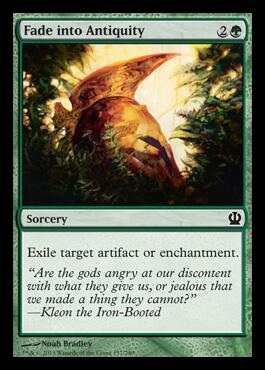 These cards include underpowered creatures, overcosted spells, and corner-cases (or cards that absolutely should always stay in your sideboard until needed). 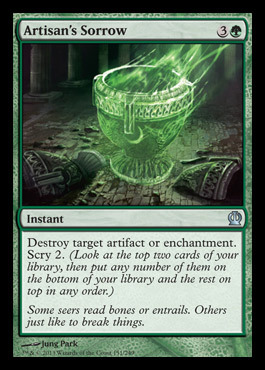 Avoiding these in draft and sealed is usually a surefire way to build a better deck. And, that's all I have to present for now. 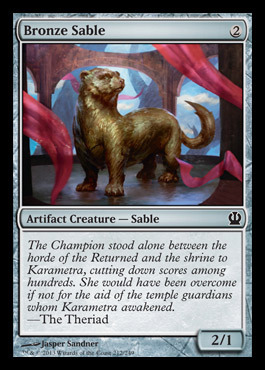 As many already know, the pre-release events are this upcoming weekend and each player will be given 6 packs - 5 Theros, and 1 seeded pack of color-specific cards (that you choose). 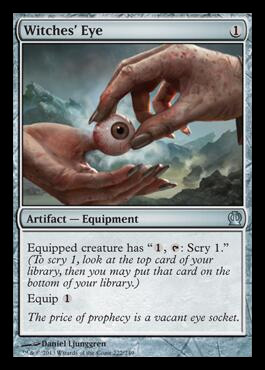 After the pre-release, we'll have a better idea of how certain cards play out (and we can comment on them at that time). Either way, stay tuned!